There’s a lot going on in NYC this time of year: Christmas-tree lightings, family in town, Cyber Monday sales to shop. But don’t let that distract you from what’s really important: hitting up these new restaurants, ASAP. We know you can do it. The beloved L.A. sushi spot with a cult following is finally in NYC, and we are happy to report that it’s more than worth the hype (and the wait for a table). We’ll take a $39 omakase any night of the week, thank you very much. Speaking of beloved transplants, we were equally stoked for this London-based Japanese-fusion noodle house to arrive. And just in time: A plate of sizzling teppanyaki is just what we need to get through the next cold spell. Chef Dale Talde and partners plant their flag in Manhattan with this “inauthentic Italian” restaurant. Which translates to bacon-clam pizza and, during brunch, polenta pancakes with brown-butter syrup. We can’t stop the sun from going down at 4:30 (ugh), but we can tell you where to find cozy vibes and elevated eats—from a former chef at Daniel and Locanda Verde—like grilled octopus with black mission fig and roasted spaghetti squash. It may be freezing out, but at least your taste buds can have a vacation with creative Mexican fare like coconut clam chowder with smoked sable and dried chile strawberries. The gorgeous (not to mention huge) space piqued our interest, and the elegant French-Italian menu sealed the deal. We’ll be hunkering down until spring with cauliflower-black-truffle gratin and fettuccine topped with prosciutto, squash and burrata. We inherently trust a chef who learned to cook from his mom, so we?re especially excited for Chao Chao?s home-style Vietnamese eats. And we?re baffled as to how we?ve survived this long without breakfast fried rice. The latest endeavor from pasta wizard Andrew Carmellini is a bright, wood-paneled dining room that serves rib-sticking fare like sea-urchin spaghetti and wood-fired pizza. The next time we feel the winter blues coming on, we’ll head straight to this Filipino barbecue joint for an instant pick-me-up in the form of overnight chicken adobo, tuna-mango ceviche and an avocado shake. 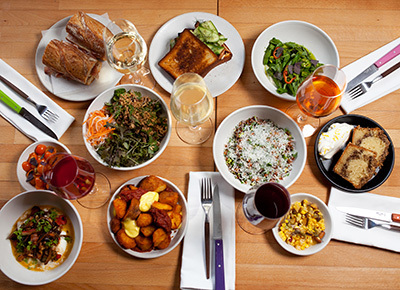 Upper East Siders, meet your new healthy breakfast/lunch/anytime spot. The Cali-inspired menu includes this absurdly pretty beet-tahini toast with blackberries and purple basil. We may have fallen in love with poke over the summer, but this spot makes a great case for keeping the flame alive through the colder months, with bowls, burritos and hand rolls showcasing jewel-toned fish. Attention Astorians: Curry bowls and Kolkata-style wraps (with fillings like scrambled eggs and green chiles or smoked eggplant) await you at this fast-casual BYOB spot. Your after-work meetup with friends could use some roasted-pumpkin toast with chipotle honey and thrice-cooked fries. Should you find yourself on the LES seeking a cocktail and snacks like lobster flatbread and spicy lamb sliders, plus maybe a velvet couch on which to enjoy said provisions, consider this your answer.